HARLEY QUINN, mallet and all, jumps right out at you after "Pop! 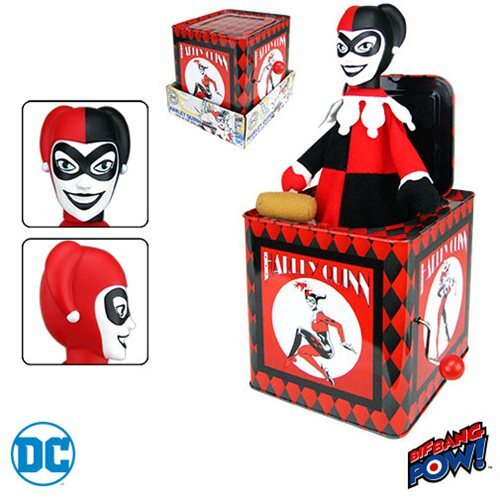 Goes the Weasel" plays when you turn the crank on this insanely colorful DC Comics Harley Quinn Jack-in-the-Box from Bif Bang Pow!. With a detailed plastic head and fabric body, the classically styled HARLEY QUINN™ figure features the kooky criminal in her trademark red, white, and black colors that’s packed inside a retro tin jack-in-the-box, measuring 5 1/2-inches tall x 5 1/2-inches wide x 5 1/2-inches long.